The Tree Of Life won the Palme d’Or at the 2011 Cannes Film Festival. The film isn’t the typical drama you’d come to expect. Instead it’s more introspective and delivers a message of a common theme of the human existence. The movie’s story starts upon Mrs. O’Brien receiving the news of her son’s death. Mrs. O’Brien had always been taught everyone must choose between the path of grace or the path of nature. The son’s death would throw the family in turmoil. The movie then focuses on present-day Jack O’Brien, now an architect. When a tree is planted in front of his building, he reminisces about his life as a young boy during the 1950’s. A pre-teen Jack is living with his family in suburban Waco, Texas and is now forced to choose the path for himself. His parents have equal bout opposite influences on him. His mother represents grace as she is gentle and nurturing but authoritative, presenting the world as a place of wonder. His father represents nature as he is loving but strict and authoritarian as he tries to make his boys tough for a world here perceives as corrupt and exploitative. He often questions giving up his passion of becoming a musician and instead became an engineer and hopes to achieve wealth through filing patents of his inventions. Before Mr. O’Brien goes on a trip to market his inventions, a drowning death of a child at the town pool happens. Mr. O’Brien suddenly turns violent and unleashes an abusive rage on his boys and Mrs. O’Brien. While he’s away, Jack and the boys are raised exclusively by their mother and his feelings of rebelliousness start happening. Jack follows along with the other boys in his town and commits acts of vandalism and animal abuse, even theft of women’s underclothing from a neighbor’s house. It’s after that where Jack gets the first natural sense of his consequences and throws the stolen underwear in the river. Mr. O’Brien returns home having failed to sell his inventions. His plant closes and is given the option of staying with the company with an unpromising job or be terminated. He chooses the unpromising job which means the O’Brien family would have to move away from Waco. Upon leaving he asks Jack to forgive him for the harsh treatment of him. What I just stated in the above synopsis was of the events that happened in the drama. That’s only half of it. The other half is what happens in the more sublime parts. The opening image of the movie is the mysterious flame that flickers in the darkness. We see it at the beginning of the film as it leads to the opening scene of Mrs. O’Brien receiving the news of her son’s death. Just as soon as an older Jack O’Brien reminisces of his childhood in the 50’s, the movie doesn’t shift back to Jack in the 50’s but of the very beginning of the universe. Galaxies are formed, planets are formed, volcanic activity and the existence of life begin on Earth, dinosaurs fight to survive and fight to conquer, an asteroid hits the Earth, and then the O’Briens marry and have Jack and his two brothers. This leads into the main drama of the story. After Jack reconciles with his father the sublime returns as it fast forwards to an Earth five billion years later incinerated and shrunken by the sun and left completely devoid of any life. The movie returns to the present as Jack leaves work and encounters a vision of walking on rocks. As he walks through a lone wooden door frame, which is probably the door from the house in Waco which doesn’t exist, and is reunited with his family and all those who were in his life. Even those that died including his brother have been resurrected. The movie ends with the mysterious flame seen at the beginning continuing to flicker in the darkness. For those who’ve seen the movie, there’s no question that the movie is very much thematic and gets you thinking. The biggest theme of the movie has to be the constant dilemma of the way of grace vs. the way of nature. It’s a constant choice everyone has to face in their life. It’s also made present in the movie that this dilemma has existed ever since there was life on Earth even before the human race. It’s a dilemma Jack is forced to confront as a child and witness his parents representing the two opposites. The way of grace is given additional support by the messages given by the priest. The way of nature is given additional support by all the rough, even destructive games the boys play. That theme and the various part of the film, both in terms of the plot and the sublime, focus on the theme of grace vs. nature being the universal pulse. If there’s one weakness of the film that stands out, it’s that it tries too hard to be artistic and creative. I actually admire films that try to be original and take artistry to new levels. The only problem is all too often, many artistically inclined films look like they forget they are to be shown in front of an audience. When I critique movies, my attitude towards the more artsy films is: “Okay, I know you are trying to be artistic and creative but don’t forget you’ll be seen in front of an audience.” I also have a tough attitude towards commercial movies: “Okay, I know you want to make big money but give the audience their money’s worth.” Overall I feel a film doesn’t have to be entertainment but it should do something with the audience, like connect with them or get them thinking. Enough about my critiquing guidelines. The problem with the Tree Of Life is that firstly it takes a subject matter that is common. It also tries to connect the dealings of loss and lost innocence with the existence of earth and the universe itself and even the spiritual world. Yes, it makes for some creative film crafting and original themes but it doesn’t succeed in grabbing the crowd or make them involved in the story line. Often the story tries too hard to let its sublime side get inside the audience that the story comes across as humorless and even unwatchable or confusing at times. That has to be the biggest glitch and that’s why I feel it doesn’t deserve to win Best Picture. Terrence Malick does his best to write and direct a watchable movie about lost innocence and reconciling with the past that tries to get inside the audience, but it misses in a lot of ways. The best acting performance overall had to come from then-newcomer Jessica Chastain. It was her performance as Mrs. O’Brien, the struggling housewife, that was the most complex as she plays a character who struggles to keep the calm of the family despite the many fierce adversaries that come their way. Even though Chastain earned an Oscar nomination in The Help, I felt her supporting performance here was much scronger and deeper. Brad Pitt also did well but it was not his best acting performance. Actually his performance was more of a supporting performance as was that of Sean Penn. The leading performance of the movie actually comes from young Hunter McCracken. As young Jack O’Brien, he embodies the loss of innocence unraveling through its joy, anger and its heartbreak. Through young Jack, we see the embodiment of what being a young boy is all about in both a boy’s toughness and tenderness. Young Jack sees all that is happening and what would lead to the decline in relationship with his father that would pave the way for the reconciliation. The film’s best qualities are the cinematography by Emmanuel Lubezki and the musical score by Alexandre Desplat. 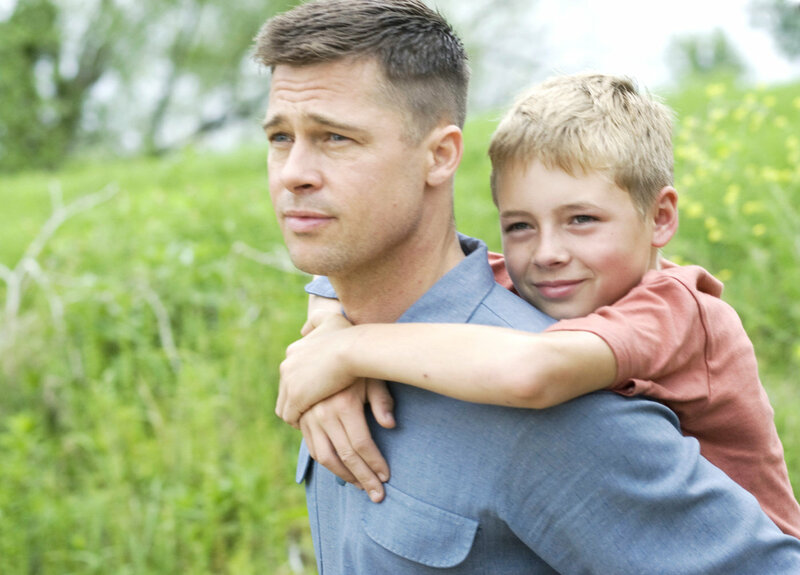 The Tree of Life tackles familiar themes of coming of age, loss of innocence and reconciling with the past. The problem with it is it tries too hard to connect it with the existence of the universe, all life on earth, the end times and even the spiritual world. Although it didn’t really appeal to me, I’ll just sum it up by saying it’s a love-it-or-hate-it film. We are all told at one point in our lives that we can no longer play the children’s game. We just don’t know when that’s gonna be. Some get told at 18, some get told at 40, but we’re all told. I don’t know about you but I don’t understand the whole deal about sports and the dollar. One thing I do know is that the mix of sports and money has sure changed professional sports in the last 40 years. It’s the reason why a franchise stays in a city or moves. It’s the reason why stadiums and arenas are now named after corporations. It secures broadcasting rights and merchandising marketing rights. It’s led to numerous league strikes; two of which either prevented a season from happening or ended a season prematurely. Most of all, it has the biggest bearing on how far up the league a team excels. Major League Baseball player-turned manager Billy Beane was the subject of the book Moneyball on his experience as a manager and introducing the use of sabermetrics in managing the Oakland Athletics team of 2002. It’s been made into a movie starring Brad Pitt, Jonah Hill and Philip Seymour Hoffman and it’s worth seeing. The movie begins just after the Oakland Athletics were eliminated from World Series play in the 2001 American League Division Series by the New York Yankees; a team with three times the money as the A’s. After losing its three star players to teams with bigger money, general manager Billy Beane tries to assemble a winning team with Oakland’s limited budget but is irritated with his scouts’ decision making. Billy does have a personal issue with baseball scouts. When he was 18, he was scouted out as a phenomenal talent and was signed up with MLB, foregoing a promising college education. His career as an MLB player didn’t pan out and his promise was never realized. After retiring from baseball having played his last game with the A’s in 1989–ironically the last year the A’s won the World Series–Beane became GM of the team years later. Upon visiting the Cleveland Indians, he meets Peter Brand, an economics grad from Yale with radical ideas in scouting baseball players but is very inexperienced with the business of Major League Baseball. Billy is so impressed with Pete’s thinking and choosing–including how Pete would draft Billy– he hires Pete as assistant GM. Pete’s assessment of players via sabermetrics, statistical analysis of players, and his ability of noticing qualities in players most MLB scouts overlook impresses Beane and helps him make some good player choices. However the scouts at the A’s and manager Art Howe are unimpressed with their use of sabermetrics and believe it’s effectiveness is trumpted by team play on the field. Despite it all, Beane has hope in Pete’s influence on his choices. The beginning of the 2002 season does not look well. Oakland finds itself in the lower rankings at the early part of the season. Mostly it’s because Howe’s roster decisions conflict with that of Beane and Brand. Even as the A’s find themselves in last place in their Division, Brand still believes his prediction that the A’s will make a huge turnaround in July. This comes as a problem as Howe is still stubborn in his choices. This leads Beane to make tough trading choices for his more struggling players while Howe favors. Beane even gets Brand to tell a player he’s traded. Now with the new set-up happening in Beane’s favor, we do see a turnaround. The A’s start winning, winning and winning. After winning their 19th straight game, they’re poised to break an MLB record for longest winning streak. One thing Beane notices is that whenever he’s at an A’s game, it’s bad luck for the team. This is the first game of the streak he attends. They have an 11-0 lead when suddenly things go wrong. Error after error happen and the game goes into extra innings. Nevertheless the miracle happens and the streak record is there’s. But it doesn’t stop there. The A’s find themselves back into the running for the World Series playing the Minnesota Twins in the ALDS. They hope it’s not a repeat of what happened to them against the Yankees the year earlier. This also appears critical since this could be whether Beane is kept on as the A’s GM. The game doesn’t go as expected and the aftermath doesn’t either as Beane rejects an offer from the Red Sox to stay with the A’s. I’ll wait for you all to see the movie to find out how much the BoSox offered Beane. Without a doubt the biggest theme in the movie is money and how it’s changed the sport forever. It plays a role in how it makes certain teams excel further than others. It plays a role in how new players are selected and often enough it’s about their marketability instead of skill. When I saw that scene at the beginning when Oakland’s scouts are choosing players based on image, I asked: “Since when did playing sports become showbiz?” It plays a role in how players are hired, traded and terminated. It even tempts young players, like Billy himself back in 1979, into making an all-or-nothing decision where only time decides if it’s the right choice or not. Sometimes it pans out and sometimes, like in Billy’s case, it’s the deal with the devil. It even causes a power struggle between the managers and the coaches. Often the biggest team issues are more off the field than on the field. As much as the mix of sports and money is the predominant theme of the movie, it’s also trying to introduce something new into Major League Baseball. Now Major League Baseball has to be the sports league most reluctant to change. While every other baseball league uses aluminum bats, MLB is still strictly wood-only. Drug testing was only introduced in recent years. Even decades ago, video relays and the lights at Wrigley Field caused huge debate. Now for Billy and Pete to introduce sabermetrics via computer into use on their team, even that comes into question with the men with traditional mindsets. I’m sure sabermetrics has attempted to make its way in before even without computers but it never really left much of an impact. Even after it helps the A’s break the winning streak record, it’s still debated after the A’s were eliminated from World Series play. Eventually it does become accepted by some, but not in a way expected. Another theme that gets overlooked in this movie is about personal relations in such a cutthroat business. Billy has to be a cutthroat fiery worker if he’s to be a manager of a Major League Baseball team. Nevertheless in this fierce business, he’s able to befriend Pete. Interesting since Billy is fierce and cutthroat while Pete is shy and reserved. The movie is also about how Billy comes off as a father to his daughter. You can tell how much of a bond that means to him. The best quality of the movie is how it’s able to make a story that’s very smart very winning on screen. It’s able to take a very intelligent and very popular topic and create a story about it that’s able to entertain audiences and keep them in suspense. It’s able to have an ending that’s different from your typical Hollywood ending and still come off well. Scriptwriters Steve Zaillan and Aaron Sorkin did an excellent adaptation to make a story thrilling with unexpected turns. Bennett Miller also did an excellent job of direction. Mychael Danna delivered and excellent accompaying score. However the movie’s best quality is its acting. Brad Pitt did a very good job in paying a role that wasn’t your typical Brad Pitt role. Jonah Hill was also excellent in a role that was different from the ‘big goofball’ roles he’s been known for. Philip Seymour Hoffman again becomes the character in his latest role and again pulls it off excellently. It’s this type of work that has to make Moneyball the best baseball movie in years. 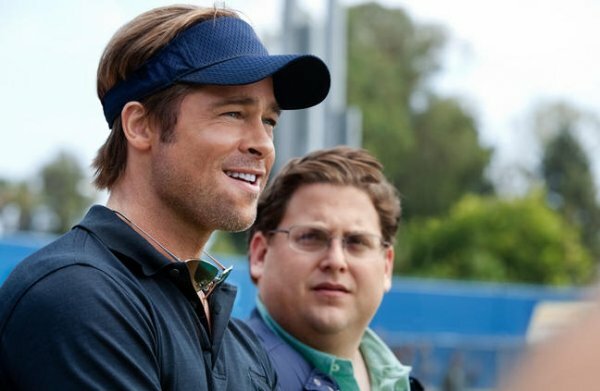 Moneyball is definitely this fall out-of-leftfield surprise winner. Even if you’re not a baseball fan, it will open your eyes about sports and actually get you hoping for the A’s. Even if you don’t like baseball, or movies about it, you’ll find something to like about it.